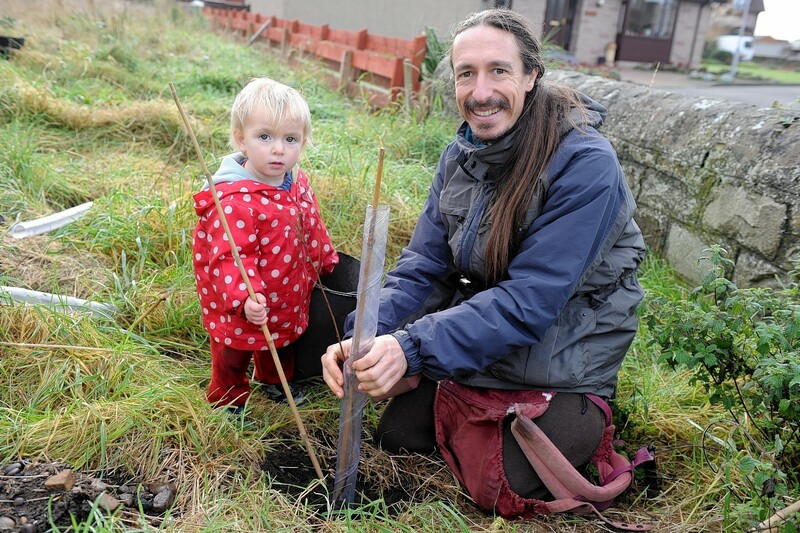 More than 200 trees have been planted by volunteers on the site of a former Moray railway station. The donations from The Woodland Trust were accepted by Burghead residents on Saturday as the community’s vision for the former station takes shape. Locals of all ages got digging in the area around the Old Station Yard, a site around three acres in size which includes part of the old railway line itself. Volunteers planted a variety of tree species, including rowan, hawthorn, blackthorn, silver birch and oak. Burghead Amenities Association’s treasurer, Hilary Gloyer, said the day brought the group one step closer to their vision for the garden. She said: “It went very well, we got lots of volunteers and lots of trees planted, the weather stayed good, it was just perfect. “I have been really pleased with the way all ages of the community have become interested as well. We hoped the garden would be an asset to the whole village, not just one section of it. “We got pensioners and kids and everyone in between. We had a lot of volunteers come and held a BBQ for them. We had to thank the troops. Work on the Burghead Community Garden began in July after plans for a community hall on the site collapsed. Mrs Gloyer added: “The amenities association had the site and had planned to build a community hall on it and the plans fell through, for nine to 10 years nothing happened at all there. Since the project began fencing has been erected on the site, along with a BBQ area and several planting boxes which are being used by local gardening groups. And the amenities group has much more planned for the area, including a woodland walk incorporating the old railway line. Mrs Gloyer said: “We’re planning lots of things. We’re planning a sensory garden, a fitness trail and adventure trails for the kids and an all-weather court.